Last year, I decided that I wanted to try my best to learn about different countries and cultures. I became especially interested in China and their Cultural Revolution. (You may recall Do Not Say We Have Nothing.) 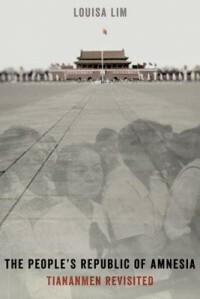 To that end, I picked up The People's Republic of Amnesia: Tiananmen Revisited by Louisa Lim which is a work of non-fiction that culls firsthand accounts from those who lived through that time and documents how their lives were subsequently changed. The biggest takeaway I had from this book was that I know next to nothing about the history of China...and most of its people can say the same. There has been so much collusion and cover-ups that most people are unaware of the true nature of historical events that occurred in their country. And those that would tell the truth are hushed up one way or another. The government's control works under the guise of "stability of the nation" which keeps the populace blind and even afraid of digging deeper. There is also a fear of the West because of massive political and cultural indoctrination that has occurred over several years. The seasons of political and cultural change can easily be marked by the different people in power. The party 'line' made it imperative that change be accepted by each and every citizen. Firsthand accounts from those who participated in (or lived through) the Cultural Revolution (more info on that here) illustrates the power wielded by those in power. All of these people are still being monitored and silenced. They can never advance in their careers which in a money obsessed country like China spells a certain shunned existence. It was a powerful, eye-opening experience reading this book. It has only increased my interest in learning about new places and people. If you're not a huge fan of nonfiction because you find it too dry then this would be an excellent one to give a shot as it reads more like a work of literature. 10/10 for the obviously thorough research and excellent writing.